Privateers have been rallying Porsche's Cayman GT4 in FIA R-GT class racing for a couple seasons now—it was 997 GT3s before that. Now, Porsche is putting a corporate toe in the water to investigate whether the company could sell a ready-made Caymany R-GT to the buying public. Next weekend in Germany, Porsche will unveil a specially-built GT4 Clubsport to run as the course car, sweeping each stage to make sure it's clear and safe for the Rallye Deutschland competitors to race. Porsche is calling this a critical test under real conditions, and has said that a decision will be made as to series production of an R-GT class spec Cayman GT4 Clubsport later this year. Romain Dumas has been racing and rallying just about anything with wheels for his entire career, and that continues, as he is the development driver for this project. For the last twelve years he's been contesting rallies all over the world with his own rally team. He's also a four-time Pikes Peak International Hillclimb champion, including setting the outright record this year in Volkswagen's all-electric I.D.-R. 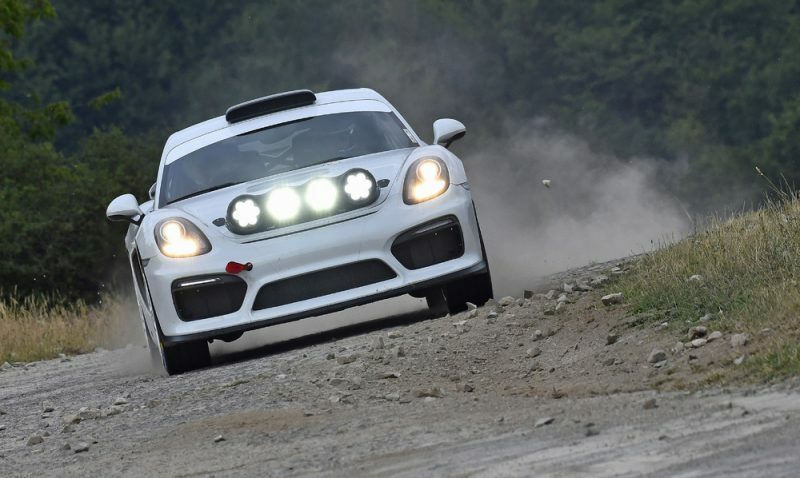 Similarly, Porsche factory drivers Richard Lietz and Timo Bernhard are also seasoned in the art of rallying, and were involved in the GT4 Clubsport concept rally car test program. The R-GT Cayman runs essentially unchanged from the already-available GT4 Clubsport package, with a naturally aspirated 385 horsepower 3.8-liter flat six engine mounted in the middle and mated to a PDK gearbox. Obviously, in preparation for rallying, the wheels, tires, and suspension have been optimized for the discipline, and full skid plates have been added to the underbody of the car, as well as energy-absorbing foam, as used in WRC cars, added to the doors. This front end is HORRIBLY UGLY!!!!!!!!! !